OK. You have a photo that was taken with your cell phone and you want to spiff it up a little, then add it to your web site. Easy peasy! Here are the step by step instructions to edit and format that photo properly using the PicMonkey.com free photo editing program. The best way to learn this process is to read through/skim all of the pages in this series, then come back here and try to follow each step using a real photo from your own cell phone. 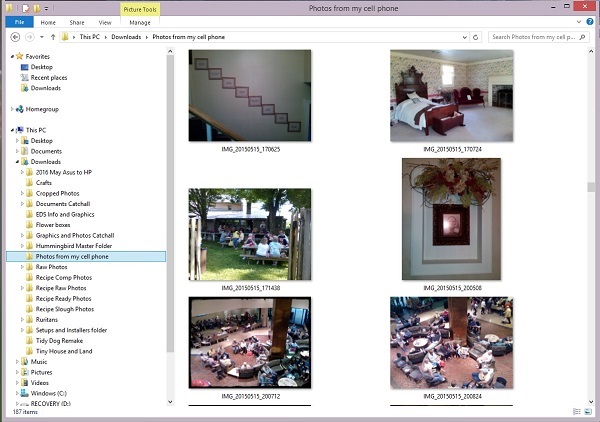 Transfer the photo(s) from the cell phone to a predetermined folder on your hard drive or online storage account, such as Dropbox. If you are using a different naming convention than mine, make note of the download destination folder name so you can find them again. plugging it directly into my computer’s USB slot. This action automatically opens a dialogue box on my PC. I drag and drop with my mouse to move the desired photo(s) from the cell phone’s Pictures folder to the destination folder on my hard drive, “Photos From Cell Phone.” If I preferred to use Dropbox as a storage area, I would open a new tab in my browser to log into my Dropbox account, and drop the selected photo into the intended Dropbox folder. 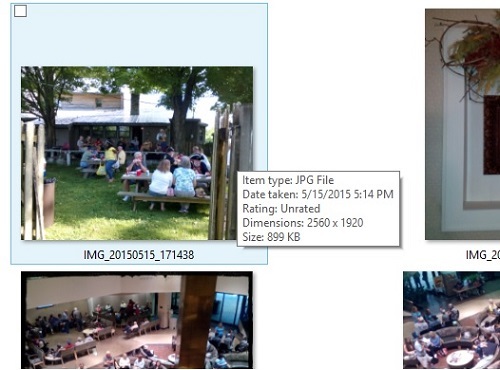 In this example, I moved the photo “IMG_20150515_171438” to the destination folder on my hard drive called “Photos from my cell phone.” This photo is a candid shot of people sitting at picnic tables, listening to music. rename the file according to our naming conventions. Then we can download the edited and formatted photo from PicMonkey to the drive to be ready for adding to the web site. Let’s get busy! Go to the next tutorial page, Introduction to PicMonkey.